The new Dynamics CRM 2013’s command bar has deliberatly limited space for buttons due to the ‘intentionally constrained’ user interface design. The idea being that if you limit the space for buttons, then designers will be forced to only show those that are absolutely necessary and the user experience will be improved. 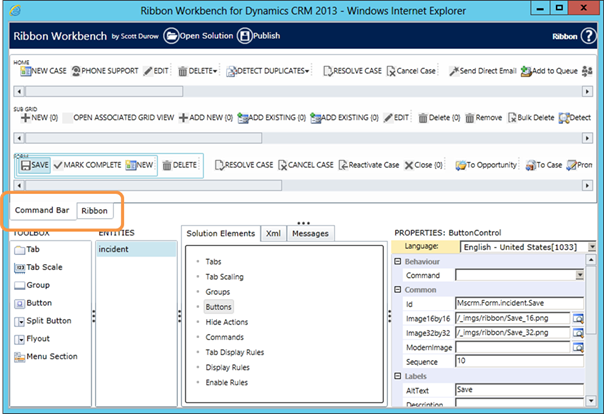 As result, many of the buttons from the CRM 2011 Ribbon Bar have been removed from the CRM 2013 Command Bar. The CRM2011 Ribbon Buttons are still there, but hidden using a new RibbonXml Display Rule named 'Mscrm.HideOnCommandBar'. 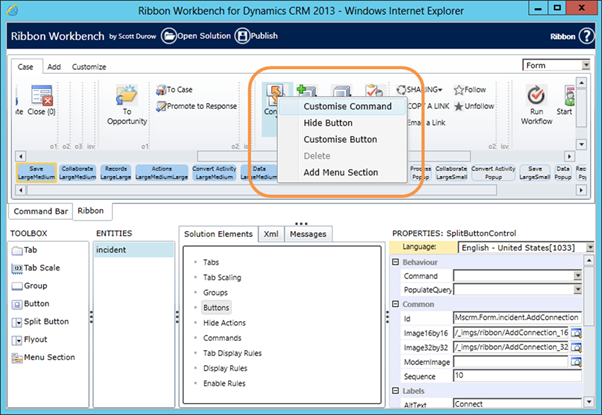 This article shows you how to restore those buttons to the Command Bar that your users absolutely must have using the Ribbon Workbench for CRM2013. 1. Create a solution containing the entities that you wish to restore buttons for. This example uses the ‘Case’ entity, and we are restoring the ‘Connect’ button on the ‘Form’ command bar. You’ll notice that only 5 buttons are shown until buttons are added to the ‘overflow’ menu. The ‘Connect’ button is not here since it was deemed unessential. 2. Open the solution containing the Case entity in the Ribbon Workbench for CRM 2013 and select the ‘incident’ entity if not already selected. You will see by default the Command Bar is selected. 3. In order to locate the button we want to restore, click on the ‘Ribbon’ selector to show the Ribbon. This will show the Ribbon Design surface. 6. 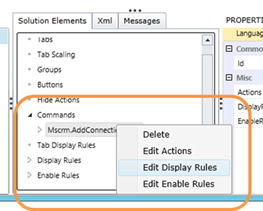 In the Edit Display Rules dialog, select the ‘Mscrm.HideOnCommandBar’ rule and click the ‘<Remove’ button. 10 Now when you refresh the Case Form, you will see the Connect button again. Remember to make sure that only the buttons that are really needed are included - the Command Bar has been constrained intentially to give your users the best experience. 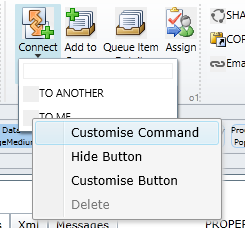 After upgrading to CRM 2013, we found out that mail merge button was missing in the command bar.